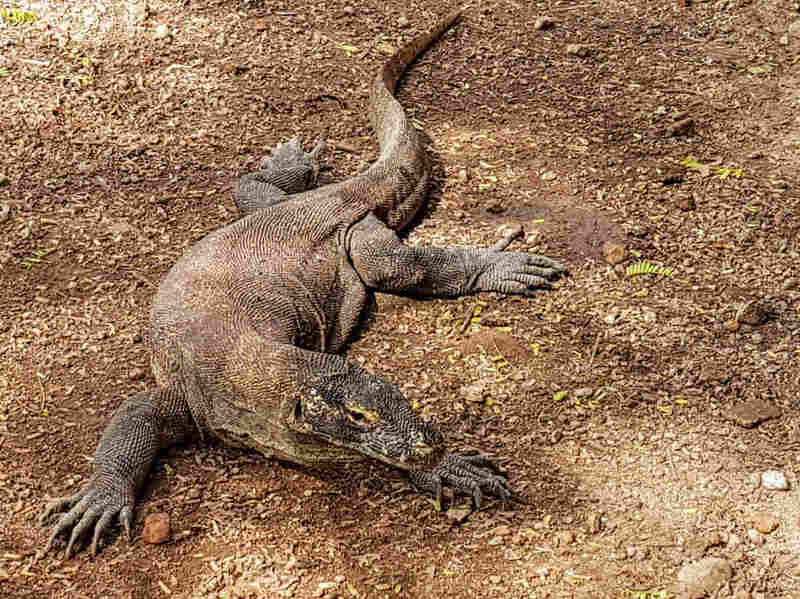 Indonesia's Komodo Dragons Could Face Risks From More Tourism Indonesia, the only country with Komodo dragons in the wild, wants to double the number of tourists at a national park where many of the animals live. Conservationists warn against too many tourists. Tourists in Komodo National Park learn about the park's Komodo dragons, classified as a vulnerable species. How's this for adventure tourism? A close encounter with a 10-foot long lizard with razor-sharp teeth and a venomous bite from a mouth swimming in noxious bacteria. It can be yours in Komodo National Park in Indonesia's East Nusa Tenggara province, about an hour's flight east of Bali. It's one of the areas the central government has targeted in its plan to create "10 new Balis" in order to meet its goal of 20 million tourist arrivals to Indonesia this year — 5 million more than last year. But local officials and conservationists warn that Bali, which alone saw 5 million tourists last year — about a third of Indonesia's total — may not be an ideal model. 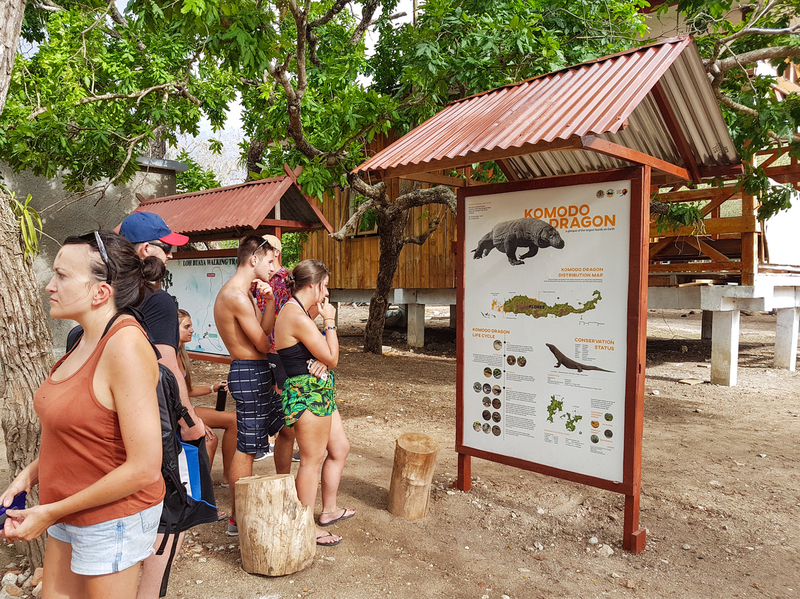 They argue that over-tourism could threaten the well-being of the park's diverse wildlife, including the Komodo dragon, which is classified as a vulnerable species. The park, a UNESCO World Heritage Site spanning 29 islands, is home to some 5,500 Komodo dragons, the world's largest lizard species, usually weighing about 150 pounds. "They are carnivores, and they eat any kind of meat," says Agus, a park ranger who, like many Indonesians, goes by one name. "Monkey, deer, wild pig, water buffaloes, even the young one, the young Komodo." They've also been known to go after the occasional human, which is why the rangers carry a long, forked staff when they lead visitors on treks on Komodo and Rinca islands, where most of the park's Komodo dragons live. The rangers use the staff to immobilize the animal's head from behind. "Sometimes it works, sometimes not," says Ramli, another ranger. "That's why I've gone up the tree several times." The stick gets a workout a couple of times a week, he says. "But I will take care of all of you, trust me," he adds. "I will save you until the end of the trek." An estimated 5,500 Komodo dragons live in Komodo National Park. The lizards lounging outside the mess hall at the ranger station on Komodo island, though, look like slightly bored refugees from Jurassic Park. Their eyes are barely open. And they're not moving. At all. Don't be fooled, Ramli says. They can strike quickly. And their saliva packs a wallop. "One bite, that's enough," Ramli says. "They have bacteria in their saliva, it's around 60 types of bacteria, and they have a poison. So that stuff will take the prey down." They bite, and then leisurely follow their prey until it keels over. A handful of islands in the park and on Indonesia's Flores island are the only places in the world to see Komodo dragons in the wild. That's a huge selling point. The central government wants to see 500,000 tourists come to Labuan Bajo, the gateway to Komodo National Park on Flores, this year. That's roughly double the number that came last year. In addition to Komodo dragons, the park is home to plenty of other wildlife. "Buffaloes, deers, boars and many types of birds," says Ramli. "And plenty types of snakes — spitting cobras, Russell's viper, green vipers and blue vipers, and all these animals are wild. So, everything is unpredictable." 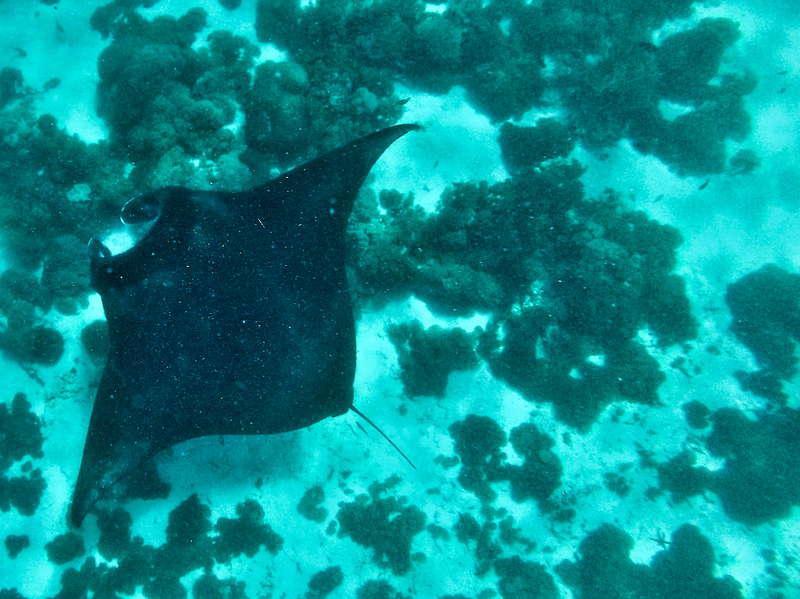 The park also boasts some of the best diving in Indonesia, if not the world. Amid the coral, divers can see white- and black-tipped reef sharks, manta rays, blue-spotted stingrays, marble rays, cuttlefish, jellyfish, wrasse, puffer fish and more. "I expected it to be amazing," says Allison Place, a tourist from New Jersey, as she rests between dives on a boat. "I don't think I expected it to be this amazing." Komodo National Park, home to abundant marine life including manta rays, is popular with divers. But the place could be under threat, critics warn, if the government goes ahead with its plan to sharply increase the number of visitors. Some rangers say there are already too many tourists. Ramli says more cruise ships are coming now than a year ago, each bringing between 500 and 1,200 people. "If cruise ship[s] bring many people like that," he says, "they won't see one Komodo. They will see nothing. Because dragon[s] are getting stressed. They are afraid of people when there are too many." "I agree with the rangers," says Theresia Primadona Rasmon, who heads the tourism office in Labuan Bajo, where the government has constructed a new airport to accommodate the hoped-for crush of new arrivals. There's talk of international flights beginning this year from Singapore, Malaysia, even China. That has a lot of area residents worried. Rasmon wants to see a concrete plan to regulate the number of visitors to the park — something local officials, the World Wildlife Fund and eco-friendly businesses are already working on. A 2018 World Wildlife Fund study showed Komodo National Park can safely handle about 150,000 divers and another 170,000 visitors on land per year, if managed properly, says Indarwati Aminuddin, WWF's Indonesia marine tourism manager. That's far below the government target of 500,000 visitors. "We do really hope the national government and local government can work together to produce a comprehensive plan for the long-term management of Komodo park," Aminuddin tells NPR via email. Indonesia is not the only Southeast Asian nation wrestling with sustainable tourism, trying to balance the need for income with the need to protect the environment. The Philippines closed Boracay island to tourists for six months last year and now imposes limits on the number of arrivals. Thailand's Maya Bay, made famous by the 2000 Leonardo DiCaprio film The Beach, was also closed last year, after thousands of tourists and the boats that brought them severely damaged coral reefs. Now the Thai government is considering keeping the bay closed until the coral is restored and fish return — or, at the very least, severely restrict the number of boats and tourists. Some of Komodo National Park's "sensitive areas," with especially high tourist traffic, Aminuddin says, "should apply open-close system for visitors, no need to open 12 months. With open-close system, we can give time for the ecosystem to recover after tourism disturbance." Such a system would allow some overtaxed areas of the park to recover for a few months, while leaving others open to tourists — instead of keeping the entire park open year-round. The provincial governor has talked of closing the park for up to a year to help increase the Komodo dragon population, but the central government won't hear of it. In January, tourism minister Arief Yahya dismissed the idea as "irrelevant," saying it would inconvenience travel agencies. Wayan, a dive master from Bali who moved to Labuan Bajo a few years ago to escape Bali's crowds, believes increasing tourism to boost the local economy will only result in short-term gains. "We can get a lot of money for one or two years, but after that, everything [will] become worse," he says. "Coral break, fish gone, Komodo go away. No fish, no manta, no Komodo, no money. That's what I think." Rasmon, the local tourism official, warns that this area should not become another Bali. "Komodo is unique, it's unlike any other tourism destination in Indonesia or the world," she says. The central government, she says, has a responsibility to preserve it.